Conestoga has been named a pre-designate Best Practice Spotlight Organization (BPSO) by the Registered Nurses’ Association of Ontario (RNAO). The announcement was made at an event hosted by the Schools of Health & Life Sciences and Community Services, and the Schlegel Centre for Advancing Seniors Care at the Doon campus on September 18. 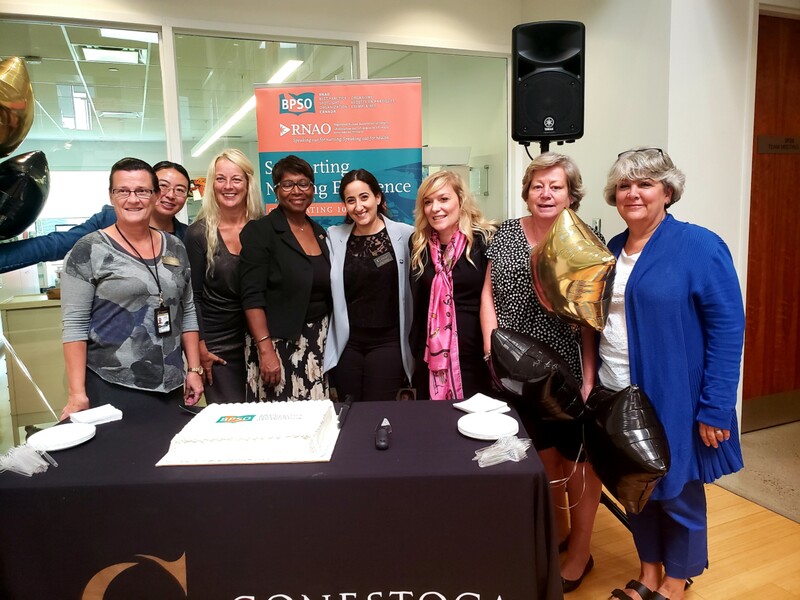 The Registered Nurses’ Association of Ontario (RNAO), and Conestoga's Schools of Health & Life Sciences and Community Services and the Schlegel Centre for Advancing Seniors Care announced Conestoga as a pre-designate Best Practice Spotlight Organization (BPSO) on September 18. As a pre-designate, college faculty, staff, students and partners will implement and evaluate five RNAO Best Practice Guidelines (BPG) over the course of three years. The guidelines provide evidence-based recommendations for nurses and health care professionals, and promote excellence in clinical care, health policies and health education. RNAO has awarded Conestoga more than $100,000 over the three-year term to implement the program. RNAO is the professional association representing registered nurses, nurse practitioners and nursing students in Ontario. Since 1925, it has advocated for healthy public policy, promoted excellence in nursing practice, increased nurses’ contribution to shaping the health-care system, and influenced decisions that affect nurses and the public they serve. “It’s always wonderful to see organizations moving towards best practice and this BPSO launch is one of the best moments for all of us at RNAO - to share in this and to see the actions and wide reach that you will now have through the work you will be doing,” said Stewart-Pyne. Conestoga’s application to the RNAO was a collaborative effort between the Schools of Health & Life Sciences and Community Services and the Schlegel Centre for Advancing Seniors Care. The Centre, under the direction of Dr. Veronique Boscart, Conestoga’s CIHR/Schlegel Industrial Research Chair for Colleges, works in collaboration with researchers, health-care professionals and the community to develop innovative education, improve workforce development and strengthen care practices in order to support care for seniors and their families. Boscart will lead the BPSO initiative at Conestoga. Following Conestoga’s three-year pre-designation period, and assuming all RNAO deliverables are met, the college will achieve BPSO designate status. BPSO designates focus on sustainability and commit to continuing the implementation, evaluation, spread and expansion of best practice guidelines in their organization and to serve as a mentor to new BPSO pre-designates. RNAO’s BPG program launched in 1999 to provide the best evidence for patient care across a range of health-care settings. Funded by the Ministry of Health and Long-Term Care, the program has overseen development of 50 guidelines to date that are implemented in provincial, national and international health care settings. Conestoga’s School of Health & Life Sciences and School of Community Service deliver a comprehensive array of career-focused programs that combine theoretical and hands-on learning.